The hike mentioned in this book is a very easy 3.6 miles and provides for some great views of the Bay and looking West toward the Coastal Mountains and even peeks of the Pacific Ocean. However, as mentioned below there are a couple different routes you can take in this park-- check out the full trail map, here. During May, the ridge area is full of wildflowers. 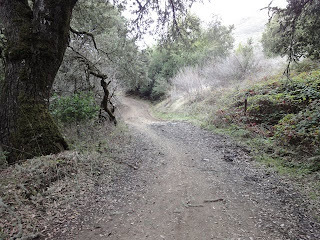 Access is very easy right off Highway 35 and is very close to other OSP parks including the Monte Bello Preserve and the Skyline Ridge Preserve. The trailhead is located right at the Parking Lot which fits about 20 cars. There is a pit toilet in the parking lot, but no running water. The parking lot is gated and is only open between dawn and one-half hour after sunset. Sometimes the Park Rangers are a bit slow to open the gate at dawn. 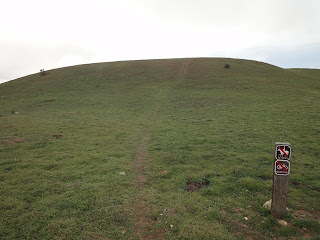 There is a another way to access this hike loop at the Vista Point parking lot about a mile North (toward SF) on Skyline Blvd (Highway 35). 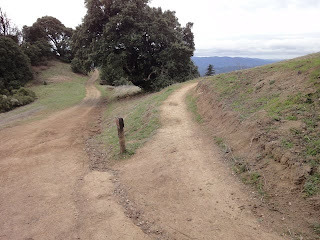 This is a mixed use trail, so be prepared for mountain bikes and maybe horses on the trails. 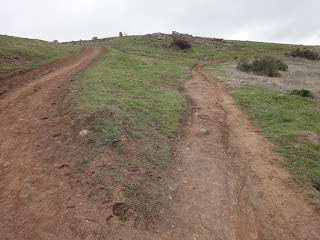 The trail is very well maintained with hard packed dirt and just a couple soft/wet spots along the way. 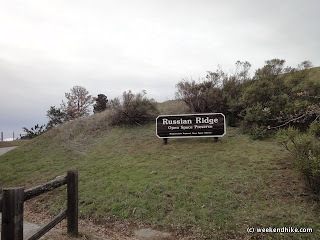 The Ridge trail (part of the Bay Area Ridge Trail) is the only access trail from the trailhead, follow it up the ridge enjoying the views along the way. After about half a mile, turn Left at the first intersection marked with "To Ancient Oaks Trail". This part of the trail opens up on to a wider dirt road with great views of the area around Alpine Road. After 0.8 miles, you reach an intersection with a smaller trail. 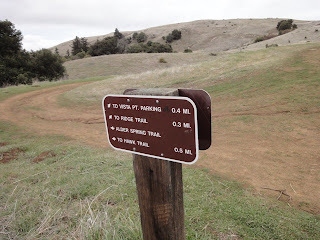 The marker/sign is a bit confusing, but turn right on the more narrow trail toward the Ancient Oaks Trail. (Otherwise you will run into a deadend on Alpine Road as I did the first time). 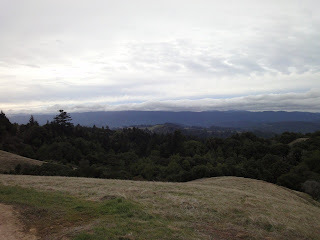 Enjoy more views looking Southwest including the area of the Portola Redwoods State Park. 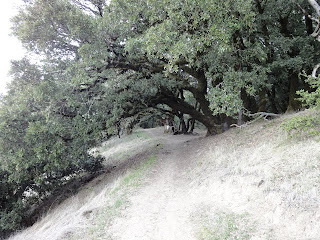 About 1.2 miles, the trail goes into the Ancient Oaks area. This is a great shaded area with some very old and majestic live Oaks. Ignore the trail junction to the right, after entering the area, continue straight on the Ancient Oaks trail. The trail continues to gently desend into more a densely wooded area. At the junction with Mindego Trail, continue to the right. 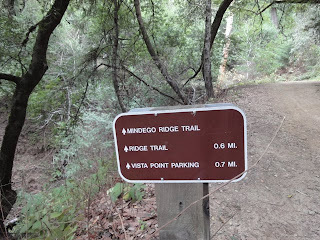 Note: The Mindego trail offers a 4.6 out-and-back spur if you looking for additional hiking. It deadends into a closed area. The Mindego Ridge trail passes a couple springs which feed into the Mindego Creek below. No real water/creek views, but its nice to hear the trickle of water along the trail. 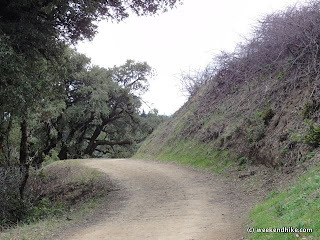 At the next junction, continue to the right on the Mindego trail up the hill - about a 200 foot elevation gain. 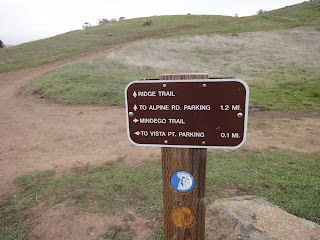 After reaching the top of the ridge, there is a slightly confusing sign and junction where the Ridge Trail, Mindego Trail, Vista Point access trail and the Bay Area Ridge Trail all meet in one area. Keep the right at the main intersection, then turn right on the smaller trail. This area is where I saw a Coyote sitting on the trail looking at the hillside below. Its another great spot to enjoy the views to the West. After rejoining the parallel trail, there is a very small trail leading up a ridge which offers great 360 degree views of the area. The trail is for hikers only, so its less traveled and a bit less defined than other trails in the park. After enjoying the views head back down to the Ridge Trail to continue the hike back to the trailhead. 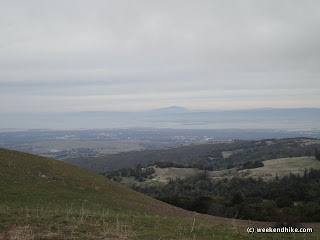 Even on a hazy/Cloudy day the area provides for some great views of the Peninsula, Stanford University and even Mt Diablo across the Bay. The Ridge trail continues back down to the parking lot and trailhead. 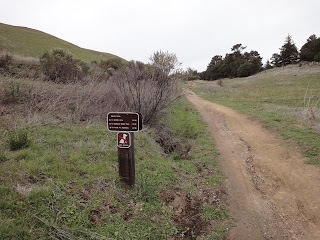 You can also access Skyline Ridge Open Space Preserve from this parking lot. Its a nice easy hike and the 3.6 miles seems to go by very fast. 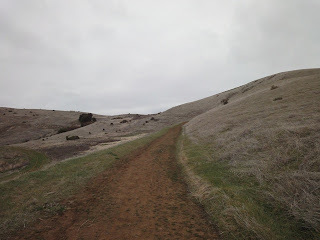 There are some other points of interest and trails in the area that you don't get to see on this hike including Borel Hill (2,572 feet elevation - the highest peak in San Mateo County). In addition, some of the other trails in the park (Alder Spring, Hawk, Mindego, etc) would make nice spur routes for a longer overall hike. That being said, this is a nice hike with lots of views with minimal elevation gain along the way. Getting There - Page Mill Road West from 280 up to Skyline Blvd (Highway 35). Cross the Skyline Blvd, the parking lot and trailhead are on the right. Fee- None, free parking. There is an alternate parking area about a mile north on Highway 35. Weather - Cool mornings, can be windy on the ridges. Other Trails - there are other trails within this park. Trail map at the main Trailhead, but bring a printout if you want to explore the other trails. 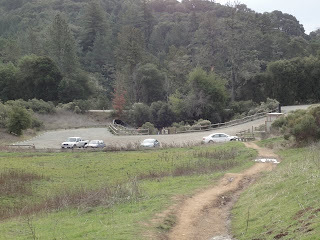 The north end of Skyline Ridge Open Space Preserve can be accessed from this parking lot via a small tunnel under Alpine Road.